We’d love your help. 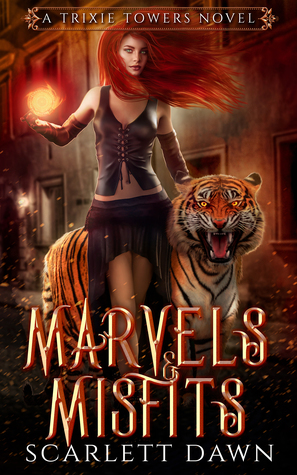 Let us know what’s wrong with this preview of Marvels and Misfits by Scarlett Dawn. What awa My name is Trixie Towers. Giants awakening to crush the world as we know it? To ask other readers questions about Marvels and Misfits, please sign up. I don’t care what it’s about. Scarlett Dawn wrote it. GIMME GIMME! New York Times bestselling author and award-winner, Scarlett Dawn, is the mastermind behind the Forever Evermore fantasy series, the Origin paranormal dystopian stories, the Vampire Crown paranormal romance thrillers, the Mark science fantasy saga, and the Lion Security contemporary romance series. Newsl New York Times bestselling author and award-winner, Scarlett Dawn, is the mastermind behind the Forever Evermore fantasy series, the Origin paranormal dystopian stories, the Vampire Crown paranormal romance thrillers, the Mark science fantasy saga, and the Lion Security contemporary romance series.